2015 sees the 50th anniversary of the “1965” peak of mod culture. This definitive 3CD/80 track compilation celebrates & charts the many sounds & the different faces of Mod culture, from original U.S. R&B/Soul (Ray Charles, Booker T & The MGs, Otis Redding, Wilson Pickett, Aretha Franklin) and Cool Jazz (Mose Allison, Mel Torme), to the growth of homegrown r&b (The Kinks, The Action, The Creation, Herbie Goins), to the adoption of Jamaican Ska (Desmond Dekker, The Skatalites, Harry J Allstars), to the subsequent development & rise of the Northern Soul scene (Frankie Valli, Gene Chandler, Archie Bell, Chairmen of the Board). 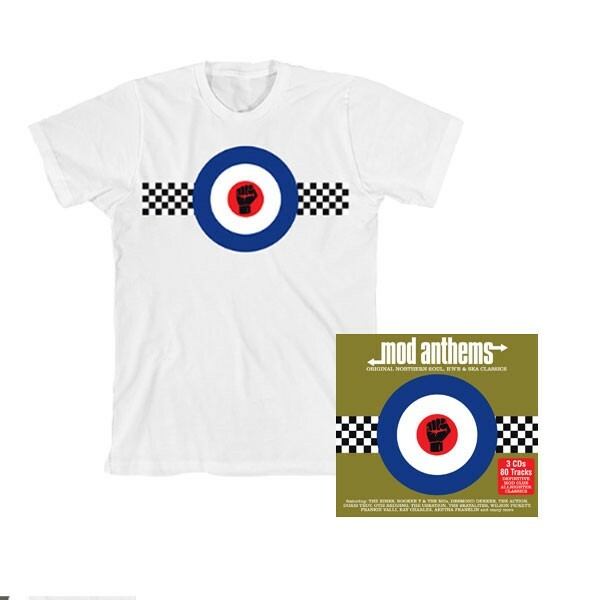 “Mod Anthems” features a floor-filling selection of both the popular and the rare Northern Soul, R&B & Ska allnighter club classic. 8. Rex Garvin & The Mighty Cravers - Sock It To 'Em J.B.